Part 4: The Dorje Shugden movement gets clandestine support from the Communist Party. 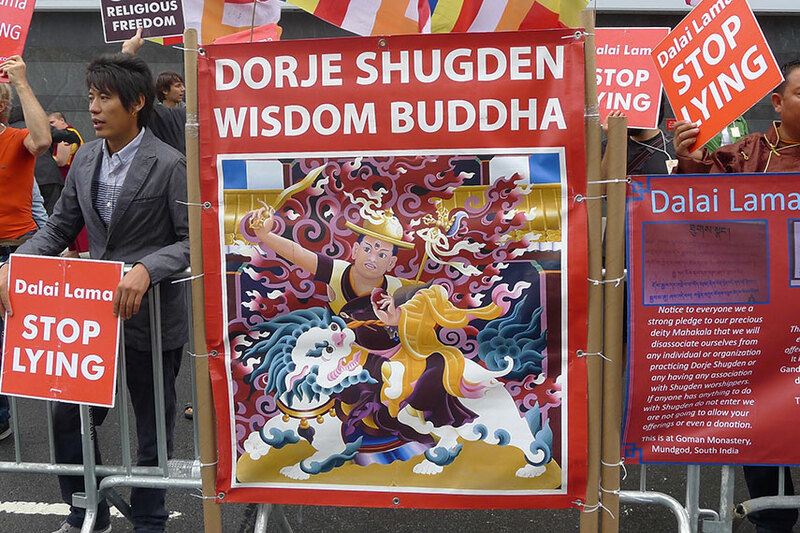 Their joint campaign to discredit the Tibetan spiritual leader is paying off, especially in Britain. ALDERSHOT, England – Thousands of Buddhists from all over Britain packed into the Aldershot football stadium southwest of London on June 29, quietly waiting under a hot sun to see the Dalai Lama. Just outside the turnstiles, another group of Buddhists awaited the Tibetan spiritual leader. “False Dalai Lama, stop lying, false Dalai Lama, stop lying!” they chanted over and over through megaphones, drummers pounding out a rhythmic tempo. When he spoke, only snippets of his remarks could be heard above the cacophony. The Aldershot demonstration was part of a pattern: Noisy protesters are following the globetrotting Dalai Lama almost everywhere he goes, denouncing him in terms that echo the invective heaped upon the Nobel Peace laureate by China’s ruling Communist Party. On the surface, the commotion appears to stem from an arcane, centuries-old schism in Tibetan Buddhism. But a Reuters investigation has found that the religious sect behind the protests has the backing of the Communist Party. The group has emerged as an instrument in Beijing’s long campaign to undermine support for the Dalai Lama, a political exile who commands the loyalty of millions of Chinese citizens and whom Beijing accuses of plotting secession for Tibet. This quarrel was once confined to the temples and monasteries of the remote Tibetan plateau and exile communities in India. But it has now been exported to the streets and stadiums of North America, Europe and Australia. Tibetan and foreign protesters say the demonstrations are organized by an umbrella group called the International Shugden Community, which in the United States is registered as a charity in California. Members of this group say they are fighting purely for religious freedom and deny China plays a role in the demonstrations. "There is no connection at all between Dorje Shugden and the Communist Party," said Nicholas Pitts, a Hong Kong-based spokesman for the International Shugden Community who frequently appears at its protests. But a leaked internal Communist Party document shows that China is intervening in the dispute. The party document, issued to officials last year, said the Shugden issue is “an important front in our struggle with the Dalai clique”. A monk and prominent former member of the Shugden movement who was based in India and Nepal, Lama Tseta, told Reuters that China paid him and others to plan and coordinate the activities of the sect’s followers overseas. 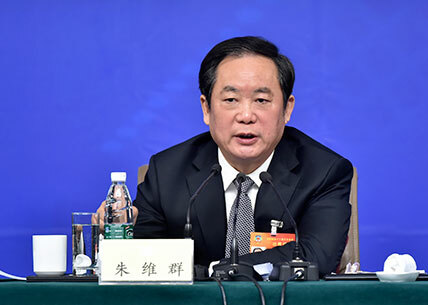 Tseta said officials from the Communist Party’s powerful political special-operations unit, the United Front Work Department, control the effort and allocate funding. These officials direct the protests through senior Shugden monks in China and the Tibetan exile community in India and the West, who are the spiritual leaders of the sect, he said. “The Chinese are using them as a tool to make the Dalai Lama look fake, to achieve their own ends, to undermine Tibetan Buddhism and to fragment Tibetan society,” Tseta said in an interview. These senior Shugden monks are treated as honored guests at official functions in China and publicly embraced as patriotic allies in Beijing’s campaign to crush support for the Dalai Lama, according to eyewitness accounts, reports in China’s state controlled media and postings on Dorje Shugden websites. A core group of ethnic Tibetans living abroad who follow these senior monks spearhead the demonstrations. They travel the world to harangue the Dalai Lama. Some attend government functions in China, and have contact with Chinese diplomats at Beijing's embassies and consulates. But they deny that China plays any role in the protests. They say they are purely demonstrating for religious freedom and pay their own way. The majority of protesters, though, are foreign recruits like Pitts, mostly Westerners. Lama Tseta said Chinese officials had instructed senior Shugden monks to enlist these foreigners in the demonstrations. Reuters has no independent evidence of direct Chinese financing of the protests. But a senior Indian Interior Ministry official said Indian authorities are aware that the Shugden sect receives funds from China. "We also keep a close watch on them because they get funding from China via Nepal," said the official, who supervises the activities of India's internal security agency, the Intelligence Bureau, and spoke on condition of anonymity. “The 14th Dalai Lama has in recent years used all sorts of means, including violent terror methods, to force certain people to abandon their religious belief,” the ministry said. The office of the Dalai Lama in Dharamsala, India, said the Tibetan spiritual leader was occupied with teaching in Southern India and was unable to answer questions for this article. How much the campaign will tarnish the Dalai Lama is unclear, but the Shugden protesters are having an impact. Coverage of the Dalai Lama’s visits in the United States, Europe and Australia now regularly includes accusations from Shugden spokespeople that he is a religious bigot with no right to speak for Tibet. The protests have become so strident that the Tibetan spiritual leader has been alerted by U.S., Indian and other intelligence agencies that there is “now a serious potential threat to the Dalai Lama’s well-being,” according to a briefing document reviewed by Reuters. That assessment is contained in the 18-page briefing prepared for the Dalai Lama's official representative in the United Kingdom, the Office of Tibet, ahead of the Tibetan religious leader’s two trips to Britain this year. The document, which was provided to the British Foreign Office, also reported that the U.S., Dutch and Swiss governments had tightened security during the Dalai Lama’s recent visits. The memo makes no allegations of a Chinese government role in the security threat. A former U.S. official said the State Department’s Bureau of Diplomatic Security was aware of the Dorje Shugden group and had to pay particular attention to it. “There’s a lot of passion around this from Shugden practitioners, and the Chinese have fostered this Shugden worship as a way to split Tibetans,” said Kelley Currie, a senior State Department advisor on Asia and Tibet from 2007 to 2009. Currie previously worked for the International Campaign for Tibet, an advocacy group promoting human rights for Tibetans. A State Department spokesperson said the bureau provided protection for the Dalai Lama during his visits to the United States but declined to discuss operational details. China’s effort to neutralize the Dalai Lama is part of a systematic and often secretive global campaign to silence criticism abroad and bring the world around to its views. A Reuters investigation this year exposed how China has used front men to set up a covert international radio network that is broadcasting pro-Beijing news. A second article revealed how China is using government-backed groups masquerading as NGOs to intimidate its critics at the United Nations Human Rights Council. 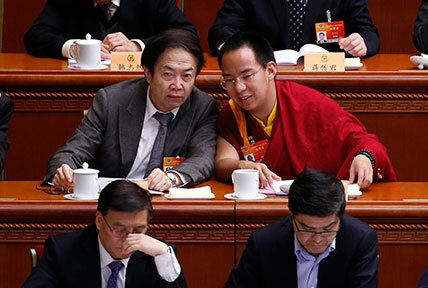 In the case of the Dalai Lama, Beijing hasn’t just co-opted a Buddhist group to challenge the Tibetan spiritual leader. It has also used the country’s economic and diplomatic clout with Western governments to marginalize its Tibetan foe. Some Western capitals are acquiescing. British Prime Minister David Cameron, former Australian Prime Minister Tony Abbott and Norwegian Prime Minister Erna Solberg are among the world leaders who have chosen not to meet with the Dalai Lama in the past year and a half. Abbott and Solberg did not respond to questions from Reuters. Beijing’s strategy has been especially effective in the United Kingdom. Britain, unlike other Western governments, doesn’t provide the Tibetan leader with official security during his visits. Ahead of the Dalai Lama’s two tours this year, his organizers officially requested protection because of fears for his safety, as laid out in the 18-page memo. The Cameron government refused the request, according to visit organizers. At the end of the Dalai Lama’s second trip, protesters pursued him through the streets of London on his way out of the country. Tsering said the Dalai Lama’s security team called the police. Within 10 minutes a patrol car pulled the pursuing vehicle over. Tsering said the Tibetan security team recognized one of the two people in the car as a Shugden protester. “We know who he is,” Tsering said. A London police spokesman said the department had no record of the incident. Britain’s Home Office said it did not comment on security matters. A month after the Dalai Lama’s U.K. tour in September, Cameron rolled out the red carpet for Chinese President Xi Jinping’s first state visit to the country. Britain secured contracts with China worth almost 40 billion pounds ($60 billion) during the trip, according to the U.K. government. More than five decades ago, the Dalai Lama fled into exile in India following a failed uprising against Chinese rule. Today, the 80-year-old religious leader retains a powerful influence over more than six million ethnic Tibetans within China’s borders. He travels the world promoting a message of greater autonomy for Tibetans. Beijing accuses him of attempting to split Tibet from China. Now, the avowedly atheist Communist Party has thrown its weight behind the worship of Dorje Shugden - a spirit depicted in temples and monasteries as a wrathful three-eyed figure wielding a sword and mounted on a lion. China’s ultimate objective is to entrench its authority over a vast, resource-rich and strategically vital region that still chafes under Communist rule. 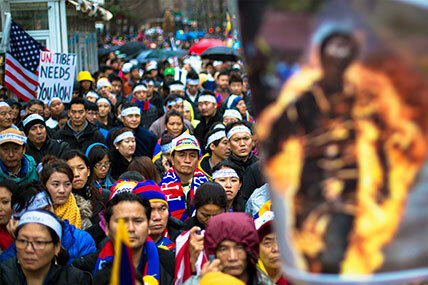 More than 140 Tibetans have self-immolated since early 2009. Beijing’s strategy on Shugden worship is contained in an internal Communist Party document setting out guidelines for officials in Tibet on how to deal with the dispute. The document, issued on February 20 last year by the Communist Party Committee of the Tibet Autonomous Region, was leaked this year to the International Campaign for Tibet. Officials, the directive said, should avoid publicizing the dispute over Shugden worship. But they should recognize that the Dalai Lama camp is using the schism as a pretext to split the motherland and sow discord. The party must “decisively grind into dust” this plot, the document added. "I do not feel you could fairly use this document to say, look, this is evidence that the Chinese government is supporting the Shugden issue," said Nicholas Pitts, the Hong Kong-based spokesman of the International Shugden Community. He pointed to a section of the document where authorities were urged to punish anyone, believer or non-believer, who used the Shugden issue to cause "public gatherings and disturbances." 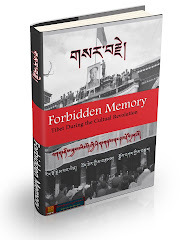 Two authorities on Tibetan Buddhism who reviewed the document – Columbia University’s Robert Barnett and Elliot Sperling of Indiana University – said they believe it is genuine. “It’s not about Shugden, it’s about politics,” said Tseta, the former Shugden member. Tseta, 42, said he was a senior figure in the Shugden sect and was responsible for dealing with Chinese officials between 1997 and 2006. He left the movement in 2008. He identified the Communist Party’s United Front Work Department as the lead agency coordinating Beijing’s efforts to undermine the Dalai Lama through the Shugden movement in India and the West. The United Front is the powerful body charged with enlisting support for the party from influential non-Communists at home and overseas. Other Tibetan monks and scholars who study the dispute identify the United Front as the key agency in China’s bid to cement control over Tibet. One of the key United Front officials directing the Shugden movement’s anti-Dalai Lama activities in recent years was Zhu Weiqun, Tseta said. Zhu, 68, a veteran official, was executive vice minister of the United Front while Tseta was active in the Shugden movement. He is now head of an ethnic and religious affairs body that advises China’s parliament. Zhu is frequently quoted in the official media as a leading government authority on Tibet, and mocks the Dalai Lama in speeches and interviews. He holds a rank equivalent to a provincial governor. Zhu did not respond to a Reuters request for an interview. Tseta said he and other Shugden monks travelled on multiple occasions to Nepal and China, including Tibet, where they met Zhu and other Chinese officials. In the interview with Reuters, Tseta produced two of his Chinese passports with stamps showing 15 visits to China. Tseta said he was last in Tibet in 2006. 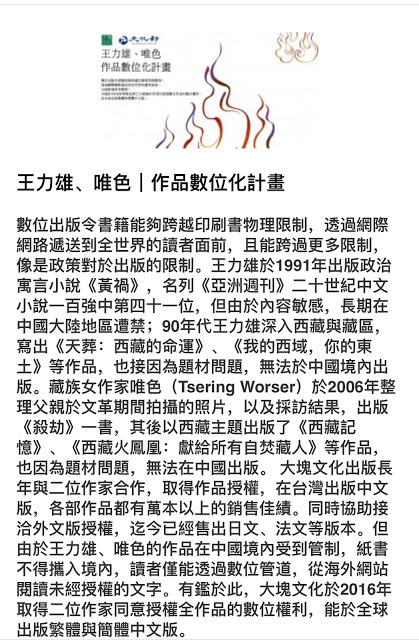 While Zhu vilifies the Dalai Lama, he has heaped praise in the Chinese media on another Tibetan monk: Lama Gangchen. Based in Milan, Gangchen is the most influential Shugden leader outside China, according to Tseta and Western scholars of Tibetan Buddhism. Tseta showed Reuters photographs of himself with Gangchen. Tseta said Gangchen organized the first meetings between Shugden leaders in India and Chinese officials in 1997. Born in 1941, Gangchen studied at monastic universities before going into exile in India in 1963, according to his personal website, Lama Gangchen Peace Publications. He later moved to Europe and has become an Italian citizen. Gangchen is a regular visitor to China, where he meets top leaders and is feted at government-sanctioned religious gatherings. 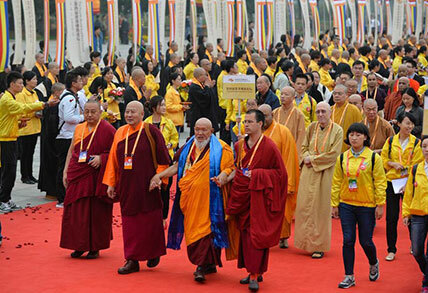 China’s state-controlled media published photos of his arrival with other Buddhist dignitaries at a forum in the city of Wuxi in October. Indiana University’s Sperling and Tibet scholar Dibyesh Anand of London’s Westminster University said they have both seen Gangchen at government and United Front events in China, where he is treated as a VIP. Tseta said he began to have misgivings about his own role in the Shugden movement, and by 2006, the Chinese were growing suspicious of him. He was detained for 25 days in Lhasa, the Tibetan capital, he said, but was released after persuading authorities he was a devoted Shugden monk. Reuters has no independent confirmation of Tseta’s detention. On a trip to the U.S. later in 2006, he applied for asylum. Tseta showed Reuters documents indicating he was granted political asylum in 2007. He said he is speaking out now about his role in the Shugden movement because the protests against the Dalai Lama are dividing Tibetans. From protest coverage, photographs, television news footage, online video postings and Shugden publicity materials, Reuters was able to identify leading ethnic Tibetans involved in demonstrations in Australia, the United Kingdom, the United States and Europe. Sonam Rinchen is one of the most visible. 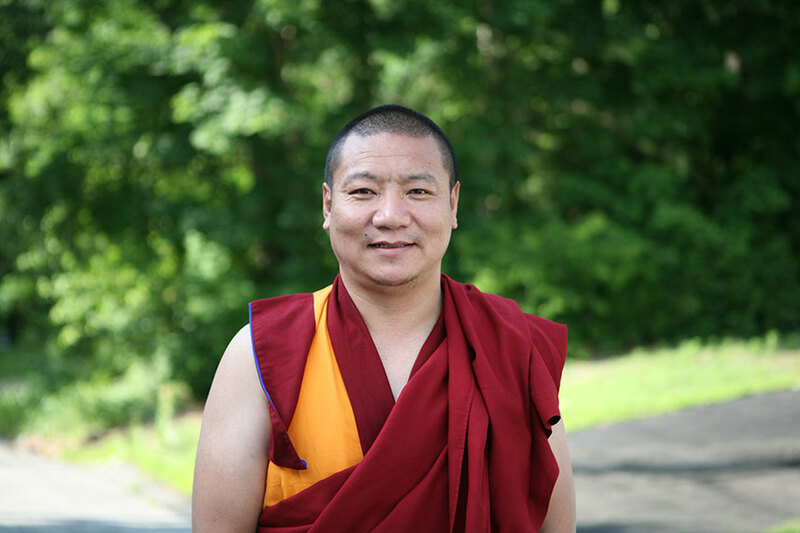 Rinchen, 53, a stonemason living in South Deerfield, Massachusetts, is a Tibetan spokesman for the International Shugden Community, the group that leads the protests. 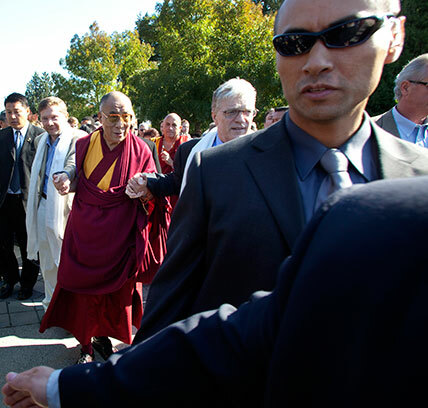 He said in a phone interview he had twice been questioned by Federal Bureau of Investigation agents about security threats to the Dalai Lama, most recently at his home in 2012 while the Dalai Lama was visiting Boston. 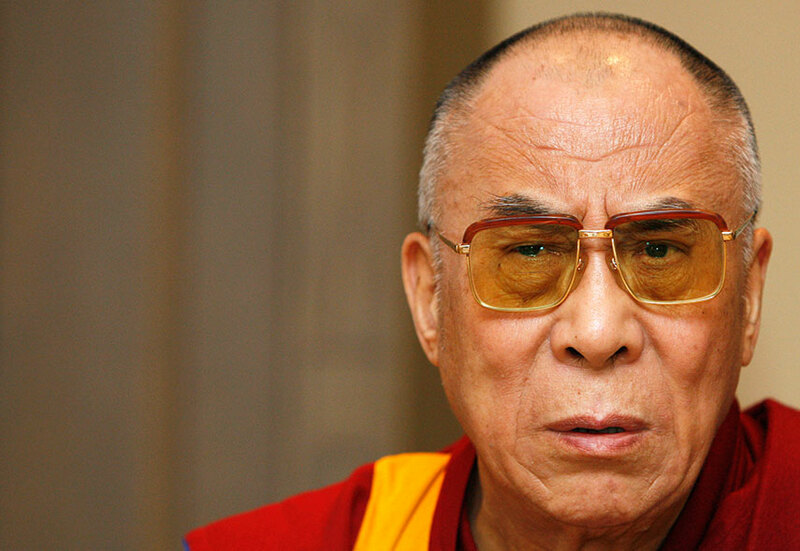 “They wanted to know if anybody paid by the Chinese wanted to kill the Dalai Lama,” he said. These were “ridiculous” allegations that the Central Tibetan Administration, the Tibetan government in exile, had passed to the FBI to smear the Shugden protesters, he said. 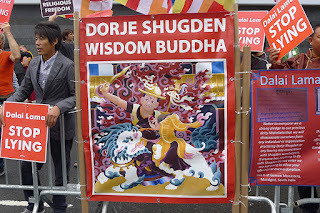 This year, Rinchen joined the protests in Britain during the Dalai Lama’s September visit. He said demonstrators paid their own airfares and hotel bills, while the International Shugden Community paid for local transport and meals. Not for everyone. In December 2014, the International Shugden Community offered 40 free return flights from Manchester to Rome when the Dalai Lama was scheduled to attend a meeting of Nobel laureates in the Italian capital, according to a notice that was posted on the group’s website. The offer included meals and accommodation for protesters. The International Shugden Community was incorporated as a charity in California in 2014, according to corporate records. It listed assets of $27,471 and income of $69,235 in its 2014 filings. The majority of rank-and-file protesters are Westerners who follow the New Kadampa Tradition, or NKT. Members say the group plays no role in the protests. It doesn’t disclose how many devotees it has, but former members estimate there are about 6,000 worldwide. The NKT’s leader and founder is Kelsang Gyatso, a Tibetan monk who moved to Britain in 1977. The NKT, a registered U.K. charitable trust, has 1,200 centers and branches in 40 countries, according to its website. It had 21.8 million pounds on its books at the end of 2014, U.K. charity commission filings show. Carol McQuire, a former member of the NKT in the U.K., said many of the protesters are unwitting agents of Beijing. “I am sure that having the protests done ‘for free’ by ignorant Westerners makes (the Chinese) very content,” said McQuire, who became disillusioned and left the movement nine years ago. The protests are attracting attention. On the Dalai Lama’s 2015 tour of the United States, many media outlets (including Reuters) carried reports covering the demonstrators and their grievances. During his 12-day visit to Australia in June, the Sydney Morning Herald and Melbourne’s The Age published an opinion piece by the International Shugden Community’s Pitts, who is also an NKT member. “He has been the political leader of the Tibetans for decades but, unlike virtually every other political leader in the world, no one seems to hold him to account or check whether what he says matches what he does,” Pitts wrote. On the Dalai Lama’s September visit to Britain, the BBC and ITV covered one of his engagements amid noisy Shugden protesters. Both outlets interviewed Pitts. Still, because of his popular authority, the Dalai Lama’s disapproval of the Shugden deity has sharply reduced the sect’s prevalence in Tibetan areas of China and among Tibetan exiles in India, Tibetologists say. Some Tibetan Shugden devotees complain that discrimination from Dalai Lama supporters has seen them ostracized in Tibet and abroad. They say they have been dismissed from jobs, refused service in shops and forced to live in spiritual ghettos. Some Dalai Lama supporters acknowledge there have been cases of discrimination. But they say it is not systematic and not encouraged by the Dalai Lama. When the Shugden protests began in 1996, they were low key, sometimes even respectful. Now they are vitriolic. At each stop, Shugden protesters wait in ambush. In the past two years, protesters have penetrated the Dalai Lama’s security cordon to confront him personally. In May last year, Shugden Buddhists attempted to check in to the hotel where he was staying in the Netherlands, according to the security briefing provided to the British government. Hotel security staff ejected them, visit organizers said. Days ahead of his two-day visit to New York starting July 9, a giant billboard reading “False Dalai Lama Stop Lying” was posted two blocks from where he was due to speak. An adjacent billboard depicted the Dorje Shugden deity. Both were taken down on July 8 after Tibetans in the U.S. complained to the advertising company, according to Dalai Lama supporters. The company declined to disclose who paid for the billboards. The Dalai Lama spoke to a sold-out crowd at Manhattan’s sprawling Jacob K. Javits Convention Center. About 100 protesters gathered across the street. Some held up a caricature of the Dalai Lama in military boots, his eyes screwed up in fury and hands balled into fists, standing on a pile of helpless Shugden monks. The same poster was on display outside the football stadium at Aldershot in June, where Shugden protesters drowned out the Dalai Lama’s 40-minute address. Additional reporting by Rupam Nair in New Delhi, John Shiffman and Warren Strobel in Washington, Ben Blanchard in Beijing, Elizabeth Piper and Michael Holden in London, and Gwladys Fouche and Henrik Stolen in Oslo. HONG KONG – The doctrinal schism that the Chinese Communist Party is using to hound the Dalai Lama arose long ago in the internecine politics of his own school of Tibetan Buddhism. During a period of reflection, the Dalai Lama began to question the value of Shugden worship on the grounds it was harmful. In 1996, he publicly advised his followers to shun the practice. Since then, scholars say, there has been a gradual shift towards Beijing by the Shugden movement - a move that accelerated in the past decade.